Rovio has released their newest game title on the App Store. 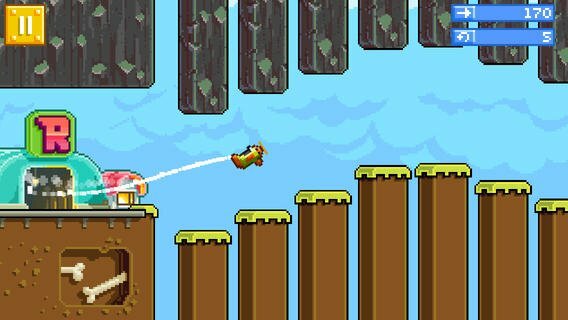 Retry features retro 8-bit graphics and is the first game released by the company’s latest publishing arm, Rovio LVL 11. SPIN FOR THE WIN! Youll need to master the loop to succeed. FLY. CRASH. REPEAT. Its called RETRY for a reason. BOOMING SYNTHESIZER SOUNDTRACK! Mega tunes for a mega game. PHOTOREALISTIC 8-BIT GRAPHICS! Jaw dropping visuals will take your breath away. Do you have what it takes? If not, you can always RETRY. Unlike other Rovio games, Retry includes a lot of advertising, including direct links to social networking websites. On the iTunes page for the game, Rovio says these links are intented for an audience over the age of 13. The universal Retry game is currently available for the iPhone/iPod and iPad in Canada, Finland, and Poland. It should arrive in other countries in the near future.